What do you do when the young people—schooled by a society hungry to teach unity, teamwork, and togetherness via the lessons from coaches and wins/losses in teams sports, and further empowered by the scholarships and education afforded to them by their play—harness all these teachings and join together to challenge the very system that insisted upon their need to internalize the value of teamwork in the first place? 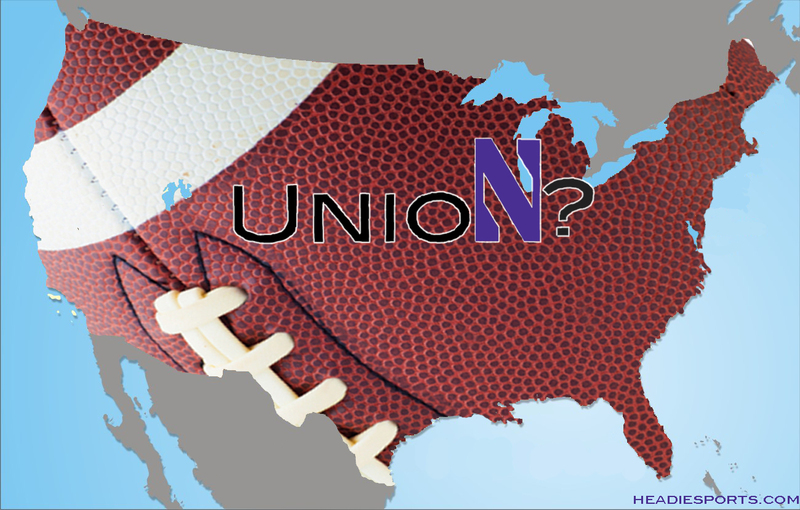 This is the paradoxical quandary Northwestern University (along with the entire college athletics system) is left to sit with following the landmark decision from the NLRB Chicago regional office suggesting Northwestern football players have the right to unionize as a collective labor group. Team sports are the training ground for where many of us learn to work in groups and unite toward common goals with one another. As a psychologist working on both ends of the developmental spectrum, with parents and kids, I see more smiles and faces light up when talking about their Saturday mornings on the field with teammates (or sidelines with fellow parents), than of just about any other experience. Sports, at their very best, are community. Nowhere is this more visible than in college sports (especially college football), which inspires a brand of zealotry, passion, and connection among Americans to a degree not seen in any other sports landscape. Regions develop and exhibit an entire collective identity based upon their football conference–brace yourself for an overdose of cocksureness if you ever dare engage a Southerner by suggesting any degree of ambiguity within the hierarchy of college football conferences (PSST-they may have a few strong opinions about the SEC). In a historical era where organized religion attendance shrinks and the middle class work day expands (subsequently reducing opportunities for social gathering), more and more of our precious opportunity for communion is housed within stadium parking lot tailgates, high school homecoming pep rallies, and Saturday mornings at the little league field. Our children are coached and encouraged to form and grow together as one unit, their fans band together around them in support, and within sports a primal need for togetherness is offered to a spiritually hungry group of people finding fewer and fewer outlets and time for union. Lessons from March Madness 2014 Part I: Canada is Important. Wiggins, Ejim, Pango, Powell… Canadian Hoopsters Abound! There is a Freakanomics type of math that we do not employ often enough when examining sports and cultural phenomena: the +18 years formula. As in, when there is something noticeable or out of the ordinary in a new generation or in a new crop of college freshman, go ahead and subtract eighteen years and identify some of the events, policies, and cultural movements that set the backdrop for this new group’s birth. With such in mind, the Toronto Raptors have given us some moments over the last 18-20 years. The franchise was established in 1995, along with fellow Canadian expansion team the Vancouver Grizzlies, as part of David Stern’s megalomanimous insistence on turning the NBA into the next ‘world sports brand’ (note the synergistic delight between the drama, conspiracies, and chicanery in every NBA offseason along with FIFA’s routine leadership style fraught with a European flopping flare for the dramatic). One would be more than fair in asking, with 18 years of data under our belts, has the NBA’s great Canadian Expansion been successful, meaningful, or even worth it at all? Somewhere in Brooklyn a 23 year old with a caterpillar mustache who’s wearing a retro ’97 Bryant ‘Big Country’ Reeves Vancouver Grizzlies jersey just scoffed at this silly line of questioning. 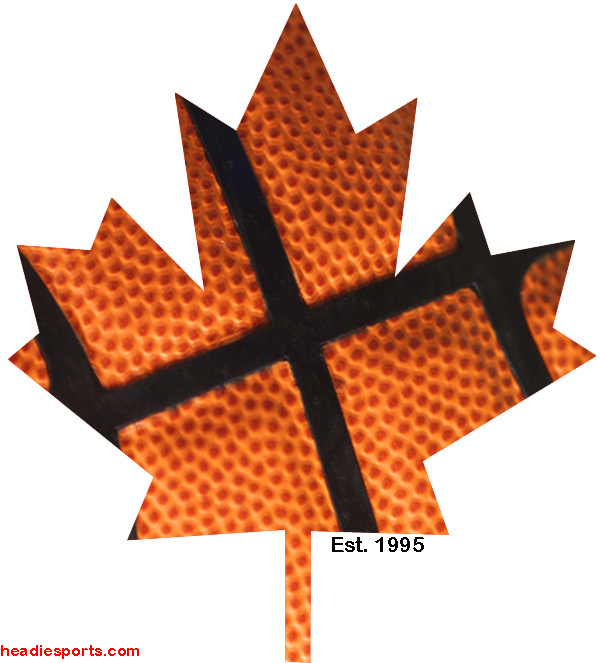 However, for the rest of us, what really has NBA branded Canadian basketball provided us? With the Grizzlies quickly having scampered across the continent to the mountains(?) of Memphis, we are really only left to examine the evidence of Ontario basketball. From the late 90s through the early 2000s the Raptors stamped their cultural mark namely with Vince Carter’s vinsanity and once in a generation dunk contest performances. With substance though, the 2001 Raptors were on the doorstep to their first Eastern Conference Finals, but fell one point short to the Aaron McKie Allen Iverson led 76ers. Looking back, this very well may have been the turning point for the franchise. Despite (or because of) their lack of future playoff success, the Toronto professional basketball team managed to become the franchise who drafted raw, athletic talent (i.e., McGrady, Bosh, Half-man/Half-Amazin), developed them, and then watched them move to greener pastures and catalyze deep playoff drives for other teams. As the departed Raptors thrived for other teams throughout the mid-to-late Aughts, the visible passion of Toronto basketball manifested namely on Internet message boards through the “Raptor Truthers” movement (little did we know, the real Toronto basketball passion was showing itself on the elementary and middle school parquet–more on that in a moment). The Raptor Truthers, a group of beleaguered sports fans trying to will their team credibility via the internet, were truly revolutionaries in establishing a rich Internet tradition as an intimidating and intense special interest sports base that browbeat sports writers to report more kindly about their beloved…as if that might change the truth about their team. Yes there were some moments in these 18 years, but it does seem far-fetched that this is what David Stern dreamed of at night when hatching this great Canadian expansion in the early 90s. As we check-in on Canadian NBA basketball as it turns the big ‘one-eight’ and can now serve its country and consume adult beverages, there is perhaps a renewed hope. For it is those little Ontario infants born of the mid 90s, seemingly growing up mimicking Carter and McGrady fast breaks on the NERF hoops perched upon their bedroom doors, that began attending college in the past couple of years, and wouldn’t you know it, an inordinate heaping of them are mighty fine basketball players. In watching March Madness this weekend the names Andrew Wiggins!, Melvin Ejim!, Pango!, Dwight Powell! extolled off the tongues of play-by-play announcers in every which direction and region this weekend along with the ubiquitously espoused phrase “and he comes from his hometown of Toronto, Ontario Canada.” The college basketball landscape is O!verflowing with Canadian talent like never before and the question raised for me is where did this sudden influx come from? Providing further example of the +18 theory, in watching March Madness this opening weekend, the play (well actually…mostly name) of Shaquielle McKissic of ASU jumped off the screen late Thursday night. Yes Shaquielle hit a few clutch shots down the stretch to give the Sun Devils a fighting shot at moving on in the tourney, but where in the world was the office wide memo that we all had another Shaq in our lives? And then it dawned on me- of course, the 18+ rule. Shaquille O’Neal came into the NBA in 1992 and within a mere three years he had a hypnotizing shoe, a taco named after him, multiple Greek/Roman nicknames, and two broken back boards under his belt (along with one NBA Finals appearance). And voila 18 years later, we have arrived at the place in history when Shaquille O’Neal’s cultural imprint gets rewarded with a new generation of folks taking on his previously under utilized namesake. Could these two examples of 90s cultural basketball icons influencing today’s tournament and young players all be some elaborate happenstance and simply a matter of correlating events, lacking true causal inference? Sure. However, I implore you though to watch March Madness this second weekend and not notice the outlier–that 2013-2014 has significantly more Canadian prospects (33 in all in the tournament) than ever before and there must be some explanation for this. Wichita State put two Canadian starters on the court yesterday, both from Ontario. The Jayhawks relied all year on their own “Canadian LeBron James,” in Andrew Wiggins. Melvin Ejim and his dapper flat top propelled Iowa State into the second weekend of the Big Dance. Something is happening here. Eighteen years ago, David Stern birthed his Canadian basketball baby. Maybe this baby had a tough go of it throughout an awkward adolescence and only recently has started to show signs of maturation in the last few years, the high school years if you will, under the new tutelage of General Manager Masai Ujiri. But who of us did not go through as much in those tricky and clumsy middle school and early high school years? The Toronto Raptors will make the playoffs this year for the first year in a long time. In a top-heavy Eastern Conference they likely will not move past where Vince Carter was able to lead them in yesteryear. David Stern might be gone, but a new generation of Canadian basketball emerges in his absence. And while the Godfather of Canadian Basketball, Steve Nash nears retirement, the investment of basketball north of the border seems to finally be paying big dividends. It would appear the best of Canada’s brand of basketball is yet out in front of us. On that note, this one’s for you, Andrew Wiggins—O Canada! Um, not really a word, or at least one that can be found in a dictionary. Canada has a drinking age?? 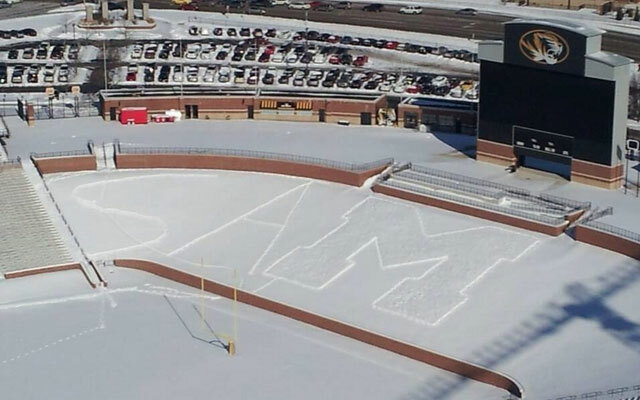 Michael Sam came out this week. Relatively unknown on the national stage beyond the scope of college football enthusiasts and NFL “draftnicks” as an All-American defensive lineman and AP SEC Defensive Player of the Year, now his name, image, and clips of an interview with ESPN Outside the Lines’ Chris Connelly are being strewn across the mediasphere for society to react to and judge. Through these initial and brief media openings into Michael Sam’s world, a few things seem clear. He appears comfortable and confident, stating clearly and firmly, “I’m not afraid of who I am” in response to Connelly questioning what it is like to be setting out on such a landmark moment in American Sports as an openly gay athlete. Regardless of how he performs this Sunday in Super Bowl XLVIII, Peyton Manning will go down as one of the five greatest football players ever. Manning’s excellence in execution has made him one of the greatest sportsmen of his generation (regards to Brett Hart). It is his gaudy regular season statistics, his un-guardable ability to be both quarterback and on-field offensive coordinator at the same time (OMAHA! ), and his scholarly approach to the game—being so detailed in his preparation and execution that even his two-time Super Bowl-winning MVP little brother still sits in his shadow. But in football, as in life, every pro still has a con. For Manning, as much as his regular season masterful execution has become his calling card, the quality that leaves NFL talking heads drooling all over themselves is his occasional (dare I say, consistent) track record of tightening up in the biggest games—his Achilles’ heel as he writes the final few chapters of his storied career. Manning has two decades of performance data on the national stage, dating back to his four years in creamsicle orange at the University of Tennessee. His quantitative numbers (win/loss %, personal statistics) have always been so outrageously excellent that he is hard to quantify or make sense of, as he literally has no historical peers or comps. He remains the greatest SEC Quarterback ever and perhaps the greatest statistical professional quarterback in history (with all due respect to Warren Moon’s Canadian Football catalog). However, the underlying qualitative story and narrative of the Manning career dating back to his college days is as “the guy who couldn’t win the big game.” In college, the rap was “he can’t beat Florida” (the alpha dog of the SEC in the mid- to late 90s). Perplexing as it is looking back, Manning’s UT Volunteers went undefeated and won the National Championship only after Peyton left Knoxville for the NFL (all it took was Tee Martin (who?) replacing Peyton at the helm to finally beat Florida … and everyone else who stood in the Volunteers way the year after Peyton left). As a Colt, Peyton led his team to the playoffs virtually every season after taking over leadership of the team as a rookie for the previously fledgling franchise. He created legends out of his cadre of offensive skill players – Marvin Harrison, Reggie Wayne, and Edgerrin James. But this legendary offense always seemed to find themselves falling a little too short when January came around. Some might suggest this tightening/choke narrative changed for Peyton in 2006 when he finally conquered his vaunted rival Patriots in a superb comeback win in the AFC Championship. 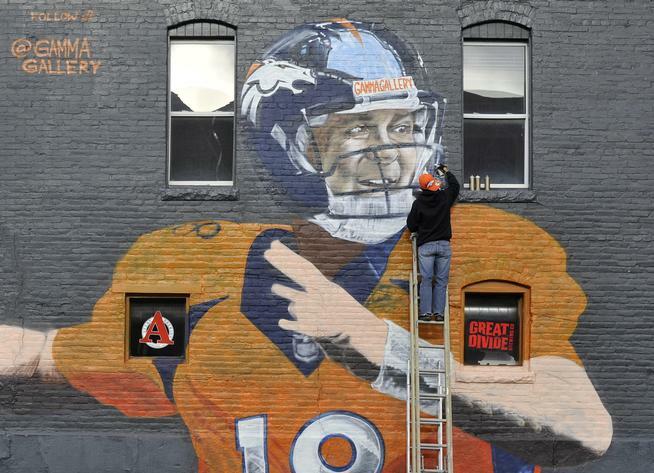 This followed by the great re-branding of Peyton as “Super Bowl Champion” a couple weeks later when his Colts defeated the Chicago Bears in SB XLI. But if you investigate beneath the final result, this was one of the sloppiest, most poorly executed Super Bowls in the last decade. The true hero was Colts rookie defensive back, Kelvin Hayden, who forced the game’s critical interception, returning it for a touchdown, the turning point of an otherwise sluggish and rain-filled Super Bowl. Cue the spotlight: New York City. Super Bowl XLVIII. The world’s most important city, in the most culturally consumed American event of the year (a day that quite frankly, “the powers that be” are remiss in not offering up the subsequent Monday as an “observance holiday” … for recovery, you know). A historically great defense standing in the way of hishistorically great offense, or as Nate Silver pointed out earlier this week on the Colbert Report, this is only the eighth Super Bowl ever that has actually pitted the two best teams of that season against each other. The stage is set, but is Peyton Manning destined to choke once more, or in this great battle of New York (East Rutherford, NJ), will he finally be able to shift his narrative into the clutch? 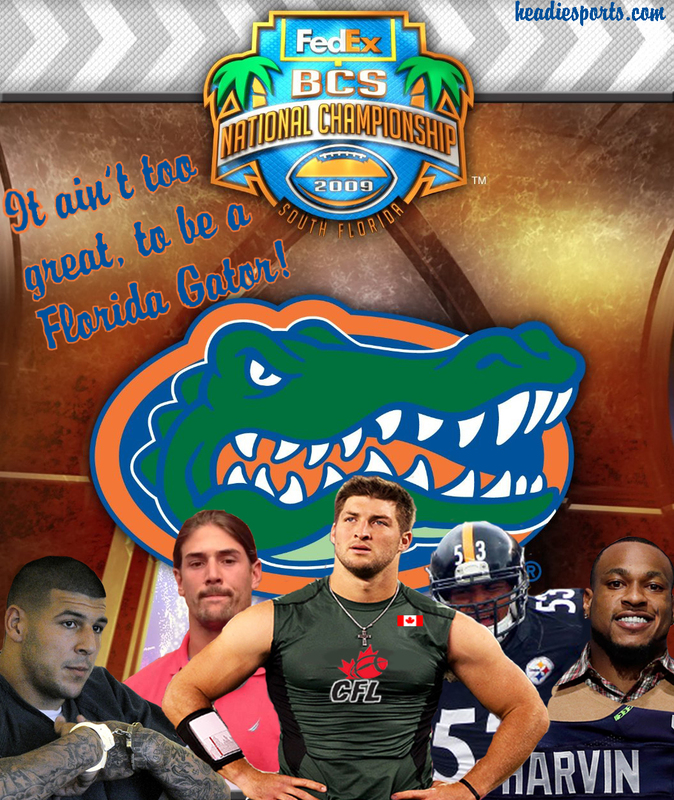 Is it Great to Be a Florida Gator?? June 26– Absent of any irony, or humanity for that matter, former standout UF tight end and former Tebow favorite pass target, Aaron Hernandez was arraigned for 1st degree murder. Haunting and tragic details manifested suggesting Hernandez led an execution style murder of his “friend,” and casually left behind hoards of circumstantial evidence like his spit out and chewed out bubble yum at the scene of the crime. Subsequently a trail of breadcrumbs has emerged leading back to previous unsolved murders and attempted murders in Boston and Gainesville with Hernandez’s fingerprints all over the case files. Most recently, a damning feature in Rolling Stone profiled Hernandez’s troubled past following his father’s premature death including: alleged gang connections, violent crimes at UF potentially swept away by an earnest Urban Meyer trying to thump some bible into this seemingly lost teen-come-thug, and rampant angel dust consumption by Hernandez over the last six months which may at least in part explain some of the dense callousness layered upon this case. July 30– In seemingly bright news for Gator disciples, 2008 stud all-purpose offensive weapon, Percy Harvin got paid and got away from the spray paint can arm of Christian Ponder. Despite this good news, consistent with the hot hot heat of summer baking down on former Gators, Harvin immediately aggravated his hip, requiring surgery that will keep him off the field for much of the first season of this grand new contract. August 1– Doing nothing to shake the image of North Florida as a wellspring of redneck parlance, former Gator All-Amurikin’ wideout Riley Cooper saw fit to drop an N-Bomb in the direction of an African-American security guard who was so rudely preventing the D-List celebrity from going back stage at a stop on the Kenny Chesney world tour. Much to the disappointment (and lack of awareness) of Cooper, he happens to live in the Western Hemisphere during the 21st century, where cell phone cameras are kind of a “thing.” The Internet heard about it, and the Internet got mad. Adding insult to slur, was the timing of the release of this uncouth video, squaw in the heart of the dog days of summer, giving most beat-less sports writers (not all, kudos to Whitlock) further opportunity to pounce a Gator. August 31– Cue the roadies: the NFL QB career revival tent is coming down. Former Heisman QB and everyone’s favorite evangelical rowdy reptile, Tim Tebow, had his NFL career absorb perhaps its final blow dart when he was cut from the New England Patriots before the start of the regular season. With Josh McDaniels, the coach/GM that drafted him into the NFL, and Urban Meyer crushholder, Bill Belicheck, giving up on the idea of Timmy as a legitimate NFL quarterback, he now more than ever seems destined to be the lead of the next season of The Bachelor. September 9– And finally this past weekend, Maurkice Pouncey, Twin A and Anchor of the National Championship offensive line, suffered a season ending ACL and MCL tear putting the rare Week 1 nail in the coffin to the Pittsburgh Steelers season that already never was. So let it be proclaimed: beware Brandon Spikes, Carlos Dunlap, Joe Haden, the Alachua County winds are swirling these days, and not in a swell direction. The 2012 SEC Championship should go down as one of the greatest college football games ever. On College Football’s Conference Championship Weekend, for yet another year, it was the only championship game that mattered. The SEC reigns supreme for another season and Southerners could not be more proud to let the rest of the country know it. You see, I am a temporary resident of Atlanta for the year, so I’ve gotten just a sip of the flavor and a whiff of the aroma of the college football culture down here. And I’ve quickly come to learn that Atlanta is the Capital City of College Football in this country. While the entire state of Ohio may gasp in horror at this statement and Austin, Texas and Eugene, Oregon may insist otherwise (as some of Nate Silver’s numbers might suggest), there is simply no other city where college football means more and where the population is more overrun with zealotry and pride than Atlanta on autumn Saturdays. Atlanta is the melting pot of the SEC: an amalgamation of Crimson Tide intensity, Gator devotion, and Gamecock pride, reaching across ethnic and social status divisions as one region passionately engaged and tuned in on fall Saturdays. I’ve joked with my new co-workers here that it seems like it would be a sin to host a wedding on a Saturday during football season in the South and they responded with a straight-faced nod and a “yeah, sounds about right” (one colleague intentionally planned her wedding on a bye week of fiancé’s adopted team). The people of the metropolitan area of Atlanta further revealed their passions for college football this year when it was announced that taxpayers would pony up $300 million in tax revenues to contribute to the construction of an entirely new retractable roofed Georgia Dome in order to continue to have a state of the art facility to host the SEC Championship (among other events), despite the fact that the current Georgia Dome is only 20 years old and received another $300 million of renovations just 5 years ago. First off, let the record state how difficult it is, in this the year of 2012, to find an actual hardbound (not even leather-bound nor smelling of rich mahogany) copy of the English dictionary. 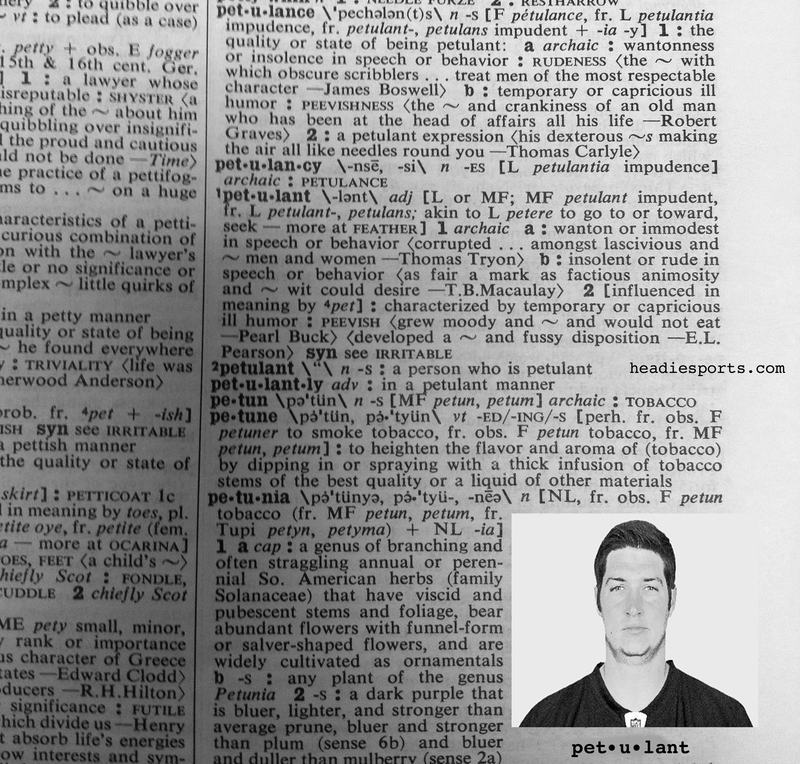 But one university research library and two reference section workers with Masters in Library Sciences degrees later, just as I suspected, Jay Cutler’s picture is indeed printed right alongside the definition of “petulant” in the English dictionary. Capricious? Check. Insolent and rude? Check. Fussy disposition? Emphatic check. Roger Goodell, the self appointed crusader and czar of NFL player health, found it within his complex web of cognitive dissonance to courageously demand teams play on 3 days rest, so the world can get yet one more night of football…and perhaps, oh I don’t know, his owners can make a few more greenbacks. 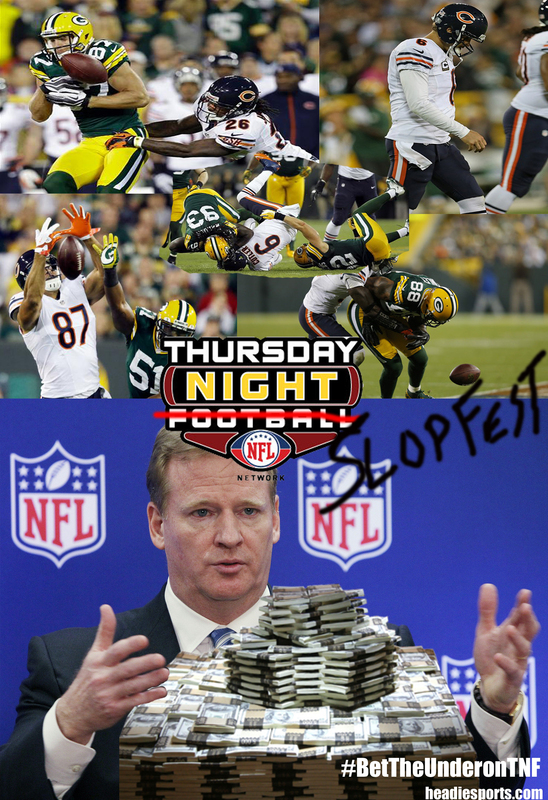 In yet another bout of wild hypocrisy (to go along with “Bountygate”), for the first time ever the NFL has scheduled weekly Thursday night games in order to commandeer one more night of voluptuous and bountiful TV ratings. Better yet, with the Thursday night monopoly on professional football his The NFL Network can gain further leverage with Time Warner Cable in their endless bickering to add the 24-hour football network to more households (at a hefty price of course) and big markets. What is lost in all of this is the fact that the product looks terrible on Thursdays. The complex uptempo offenses, amazing quarterback play, and gifted skill players fans have fallen in love with in the last 2-3 seasons all require time to master execution and rest up from the prior week’s bloodbath. But Goodell won’t have it, not when there is more $$$ on the table. Goodell shrewdly selected a Bears v. Packers matchup, that had all the makings to be one of the best games of the year. But due to his greed and insistence on placing this game on a Thursday night to spotlight his network (making it ever the more noticeable to cable viewers who do not receive the NFL Network), what could have been one of the marquee games of 2012 turned into an unwatchable slopfest. Yes, Clay Matthews racked up 3 sacks and both defenses were conceivably more active, but anyone who watched the game knows that this was more of a product of offenses depleted of healthy skill players, lacking practice, and unable to execute. Mark me down as one voice willing to forego an extra night of football to enhance the quality and health of the game. And Roger, your big crafty master plan to convince me to call up my cable company on YOUR behalf to beg them to pay your ransom for your precious product…yeah…that’s not happening either. There’s no shaking the Full House effect. Bob Saget can go around for another 15 years as the most gutter mouthed, culturally insensitive comic on the comedy club circuit and we’ll all still remember at least part of him as Danny Tanner. 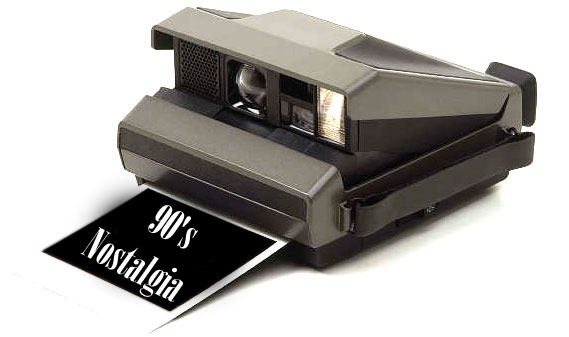 Same goes for the Olsens, if not even more so, as they rammed 892 straight-to-VHS unintelligible sing-a-long videos into our collective consciousness over a four year period (that without fail were always on in the backgrounds of extended family gatherings to keep the younger cousins quiet, while the older people could get drunk). So yeah, when I heard that Lance Armstrong dropped other more age appropriate (and quite fetching) gals like Sheryl Crow and Tory Burch for the likes of an Olsen twin, I may have been quick to pass judgement and raise an eyebrow or two. 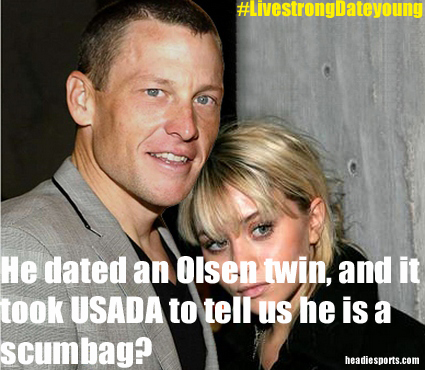 Maybe it’s ‘only 15 years’ of age difference, but he’s got to know he can’t date an Olsen twin, it’s just creepy. Prove to me that Mr. Livestrong, as an awkward 17-year-old cranking out RPMs on his stationary bike in his parent’s basement, never once viewed a re-run of Full House and then maybe we can re-visit this conversation. With that, it’s Friday, and I’m off to go listen to some of the early Jesse & the Rockers LPs. After graduating law school and taking the bar exam this summer, I recently came home to live with my parents in suburban Philadelphia. Being temporarily domiciled in my childhood bedroom might not be optimal for getting the ladies, but at least I finally have time to document my collection of early to mid-‘90s sports memorabilia. My “No Fear” t-shirts, Starter winter jackets, and L.A. Gear light up shoes are all long gone, but a few priceless artifacts still remain. 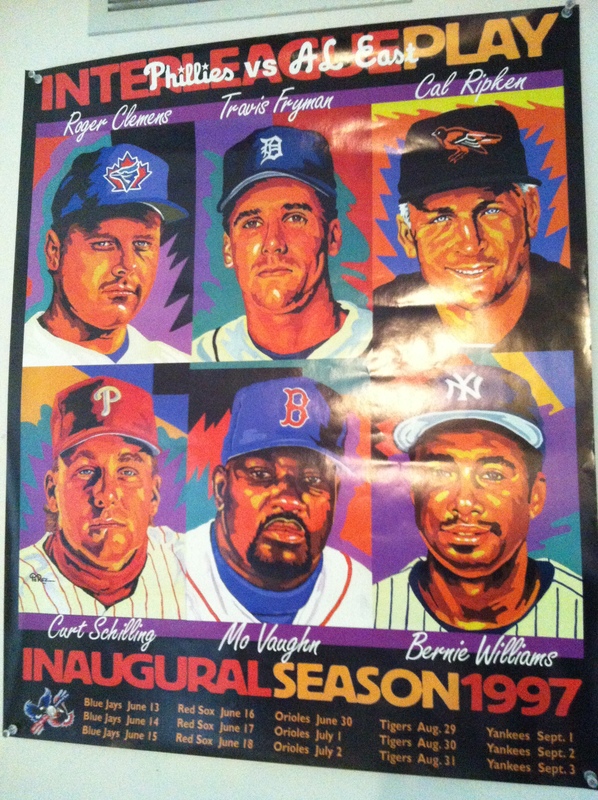 First up – this vintage poster from 1997, celebrating the inaugural interleague baseball season. The only surviving evidence that Travis Fryman ever existed.